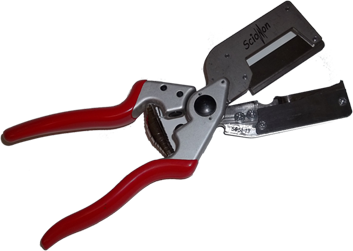 Scionon Tools, Supplies and Resources from Grafting Systems™. Grafting Systems provides the highest quality Scionon grafting tools, grafting supplies, information and other grafting resources to orchardists, vineyardists, nurserymen, horticulturalists, and others who rely on grafting to maintain productive orchards and vineyards or to propagate new plants for orchards, vineyards and nurseries. We also research and help provide innovative equipment designed to help improve efficiency and productivity in the nursery and other horticultural operations. OUR GOAL IS TO HELP MAKE YOUR OPERATION MORE PRODUCTIVE AND EFFICIENT IN THESE CHALLENGING TIMES OF LABOR SHORTAGES AND RISING COSTS. Grafting Systems™ is a division of Moser Fruit Tree Sales, Inc. and is the exclusive distributor in the United States for Scionon™ Grafting Tools and grafting supplies, which were designed, engineered, and made in New Zealand. Grafting Systems™ also closely collaborates with Oliver Agro, a family owned Italian company, which designs and manufactures innovative and specialized equipment for the nursery and horticultural industries. The Moser family has been in the nursery and fruit tree industry for over 65 years specializing and concentrating our efforts selling and brokering fruit trees to commercial orchardists across the US and operating our own small fruit tree nursery, as well as building the Grafting Systems brand in the US. Why Choose Scionon™ Grafting Tools? Scionon™ Grafting Tools will allow even unskilled employees and users to effectively and skillfully produce large quantities of grafted material. High quality grafting tools to meet the needs of commercial propagators. We welcome the opportunity to have our products independently tested. Since the introduction of its innovative grafting tools and products, Scionon™ has has won various awards New Zealand!